A few weeks ago, my Twitter feed lit up with women who were hailing the UK arrival of Lotus spread as some kind of modern day miracle. I was curious about this wonder condiment. Called 'the original caramelised biscuit spread', Lotus spread is made from Belgian biscuits that taste like caramelised gingerbread. They're the ones you get in little packets at the hairdressers, perched next to a cup of tea that immediately gets bits of hair in it. You might know them as speculoos biscuits, although that's always sounded uncomfortably like 'speculum' to me. Lotus biscuits: YES PLEASE. Speculoos: oh dear no I'm suddenly very full thanks though. You can get Lotus spread from Waitrose in both smooth and crunchy versions, priced at £2.49 a jar. It's delicious and worryingly addictive. Spread it on toast and it's sweet, spicy and warming. "I sat and ate it out of the jar for dinner," confided one friend sadly. "IT TASTES LIKE DREAMS," said another. "It is now one of my main food groups," said another firmly. She'll have scurvy soon. She's so happy though. 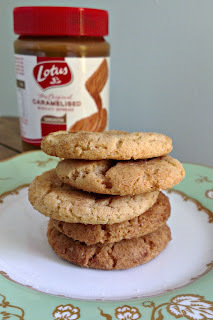 You can also bake with Lotus spread, so I've added it to some biscuits. Yes, I have made biscuits with biscuits. They're lightly spiced and the cinnamon sugar topping both looks pretty and enhances their flavour. Bake these, then sit down with the rest of the jar and a spoon. Evening: sorted. Preheat the oven to 200C/400F/gas mark 6. Line two baking trays with baking paper. Cream together the butter, Lotus spread and sugar until light and fluffy. Slowly add the vanilla extract and egg and beat until combined. Sift in the flour and fold in to make a dough. Chill the dough if it's not firm enough to work with, or if you're baking the biscuits later. Mix the cinnamon and sugar on a small plate. Scoop up a walnut-sized piece of the dough, roll into a ball, then roll in the cinnamon sugar. Repeat with the rest of the mixture. Place the balls on the baking trays, evenly spaced with a little room to spread. Bake for 8-10 minutes until golden brown and firm around the edges, then take them out of the oven and leave to firm up on the tray for 5 minutes before transferring to a cooling rack. Leave to cool, then enjoy with a cup of tea. If you're really feeling reckless, smear on some more Lotus spread before eating. Cor. Truly the stuff of dreams. In fact, I liked it so much that I now ban myself from buying it, and wrote a poem about it. Hannah, that's BRILLIANT. Did they send you a cheque? Also - would you like to contribute a ginger recipe to our Just Desserts club? They also taste dreamy. Lotus spread is my new jam. Emmyw, you will. Everyone who tastes it has their own "and then I ended up on the sofa clutching a spoon and an empty jar" moment. And another food blogger! Do you fancy doing a ginger recipe for our Just Desserts club too? I told my boyfriend about this and he called it "fatty in a jar" but I think I can handle that label just for the deliciousness! DREAMS in a jar. That's the phrase he wants. My mum developed a taste for this spread whilst holidaying with her friends in Belgium, and they dubbed it 'clacky tackle'. I was delighted to spot it in a big branch of our local Sainsburys a week or so ago, and be able to buy her a jar, so I shall also be pointing her towards this recipe! "Clacky tackle" is amazing (dare I ask why the name?). Good to know you can get it in Sainsbury's as well as Waitrose too. 80% of Sara's posts mention unicorns. I award Emma seven miniature unicorns covered in glitter for this comment. Hi Hallysann - apparently it's in Sainsbury's too, so check your local supermarkets! It was buried right at the bottom of the jam and honey shelves in mine. Ooh I feel yet another addiction coming on... Pray tell, which variety did you favour in the recipe - crunchy or smooth? I used smooth, but crunchy would give great texture. I love this in frosting on top of coffee cakes stabbed with a cocktail stick with sticky espresso glaze poured in - coffee and biscuit in a cake [I cannot/will not say cupcake!]. I just can't eat it with a spoon though, or on toast. My boyfriend however...let's just say the jar is hidden at the back of the cupboard.